This weekend I flew into Dublin. At the airport, I made eye contact with others who, like me, were wearing their Repeal and 'tá' badges. We smiled, bit down hard the emotions that rose up and cleared customs. Outside, was the usual scene of people waiting for loved ones. 24 hours from polls opening, it was a quiet celebration at this point. The oppressive voice of the No side was still felt. Yet, as the day continued, that fear lost it's hold and the celebrations grew at arrivals. People began to hope the yes side was finally the side with the power needed to affect change. For so many months, it had felt too hard and too close to call. Being in Dublin was an emotional experience for me. My family hail from Ireland, yet I am unable to vote. Visiting friends and family these past few years has been an eye opener to the intimidating and aggressive tactics used by anti repealers. I vividly remember an evening a couple of years ago as I walked along with friends. Placed at child's eye level were a series of posters outlining disgusting and untruthful facts about abortion. The images they were illustrated with were worse still. My beautiful comrade Georsan- I adored photographing you this weekend! Turning to friends I asked, "How bad is it?" I watched eyes cast down towards the pavement and shoulders hunch. I heard stories of them having to explain things to their children that none of them were ready for. I heard about attacks on women daring to be outspoken in public and damage to their property (cars has been a common one if they had a yes sticker on them). The silencing of those calling for repeal was intense and I felt that weight even as I walked through customs this weekend. Fear has a distinct prickle in public spaces, it's palpable. Yet voices did break through and with that came a change I don't think any of us dared hope for as we campaigned and raised desperately needed funds to give this a fighting chance. The voices told stories that were vulnerable, personal and harrowing. 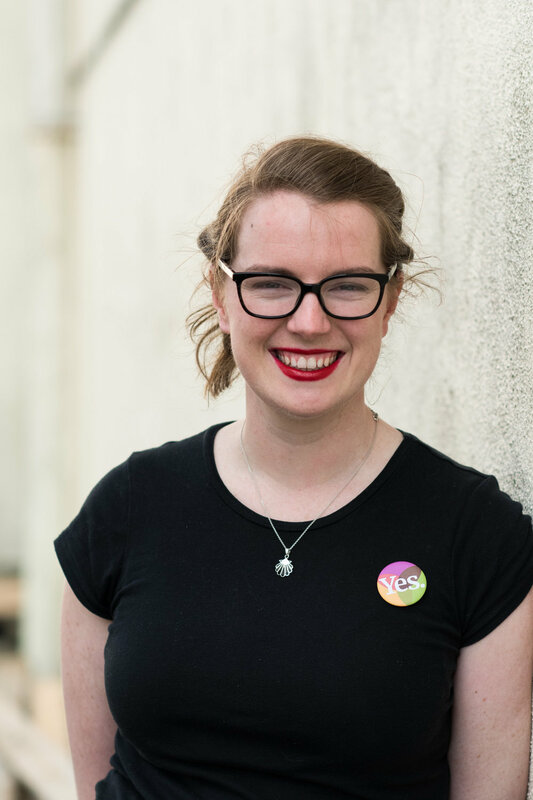 We heard from so many about what the 8th Amendment had meant to them and I don't think there's anyone who read @inheririshshoes who didn't have to gulp down tears and take a quiet moment. The tone of the campaign changed from that of shame to personal and proved crucial to the majority outcome. Now as we look to those left behind by these changes in Northern Ireland, we must consider the lessons drawn from this weekend's result. People flew from all over the world to vote. I take heart from the idea that when we speak up in individual countries to show solidarity, we may well be speaking to those able to make journeys to vote. Not only that but we help remove the social stigma of abortion and counter the voices of hate in our own backyards. Early data collected by the Repeal Shield has emphasised that the referendum was not only a locally fought battle, it was global. Repeal Shield is a crowdsourced public list of bots and troll accounts aiming to waste people’s time and provoke them in a way that detracts from their campaigns. 70.4% of those accounts blocked by the shield were created in America. With the collapse of the devolved Government, there is no way to enact abortion reform in Northern Ireland without intervention from Westminster. That means English, Welsh and Scottish citizens play a critical role in the well being of our neighbours. Right now there is a cross-party group of 140 MPs, that have signed a letter calling for the government to act. 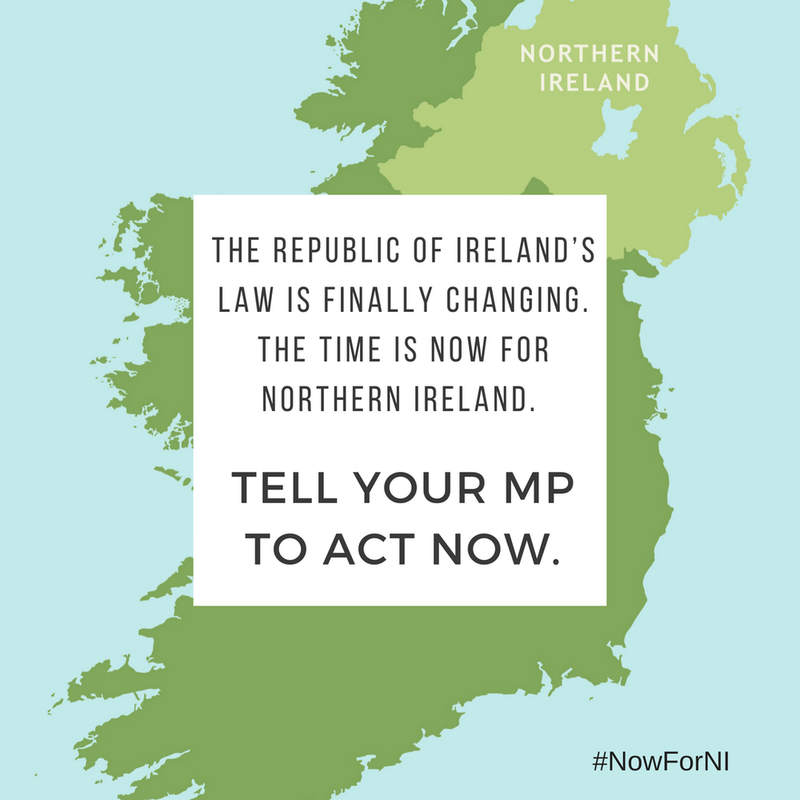 You can find out how to write to your MP to increase the pressure for this to be properly addressed in Westminster by visiting http://www.wetrustwomen.org.uk/northern-ireland/. There's even a digital template to make this easier. Please note this is a graphic that hopes to include all people who can become pregnant. A vital distinction for every person able to bear children. Talking to our audiences about the importance of us all acting to pressure Westminster into intervening on this human rights issue is going to have an enormous impact. RTÉ exit polls after the vote showed that over 75% of voters were affected by the personal stories shared by women. Talking directly, using the influence you've worked so hard to create? This is how people who can become pregnant in Ireland won their right to bodily autonomy. Let's keep that tidal wave momentum so that every part of the UK has safe and respectful reproductive health care. Those that are sharing their stories of terminations and traumatic births deserve for us to make room for them to do so. Let's not leave anyone behind. Write to your MPs, march if you are able, fund raise if you are able. Above all though, don't return to polite silence that leaves abortion conversations in a place of shame. If I learned one thing this weekend it was that we need to talk. If we are able to use our voices for others who haven't yet found the words or strength to do so for themselves without fear? You've changed a life.